Sudden cardiac arrest is the leading cause of death among athletes, but the incidence of such deaths has only been estimated, to date, because reporting has not been mandatory. A new study by University of Washington researchers, with collaborators in the United Kingdom and Qatar, suggests that the incidence may be 1 in 50,000 — four times higher than the most frequently cited figure of 1 in 200,000 athletes. "These data indicate sudden cardiac death is much more common that many people believe," Dr. Kim Harmon said. Two journals, Heart and the British Journal of Sports Medicine, simultaneously published the study online. The lead author is Dr. Kimberly Harmon, a UW professor of family medicine and of orthopedics and sports medicine. The incidence appeared higher in some groups. An analysis of insurance claims from a National Collegiate Athletic Association athletes database showed, on average, nine cases of sudden death among NCAA athletes per year, which translates to a rate of 1 in 43,000. “We don’t know why the incidence is so high among basketball players. It may be that the sport selects people more likely to have sudden cardiac death or it may be due to the demands of the sport,” she said. In athletes under 30, sudden cardiac death is often attributed to genetic disorders that alter the heart's structure or to an electrical disorder that causes the heart to lose its rhythm. As athletes age, coronary artery disease, or “hardening of the arteries,” plays a greater role. Whether such screenings should be routine for high-school athletes is a subject of debate. Harmon noted, though, that a number of public health initiatives target conditions that are much less common. Anika Bull happily displays the results of her electrocardiogram as Dr. Ashwin Rao documents Bull's heart screening. 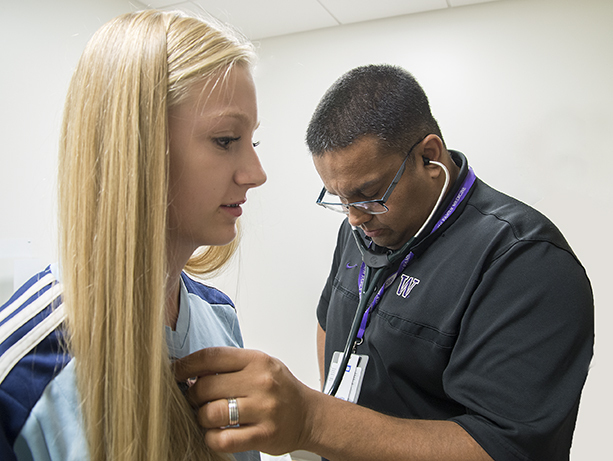 UW Medicine's Sports Cardiology program has, in parallel with the study, launched with an initiative to screen more than 1,000 players, ages 13 and up, in the Seattle United youth soccer league. The $50 screenings include a questionnaire, focused physical exam, and a non-invasive electrocardiogram, which measures the heart's electrical activity and often can detect anomalies indicating higher risk for cardiac arrest. “We are excited to get this program off the ground through our relationship with Seattle United,” said Dr. Jonathan Drezner, the program's director and UW professor of family medicine. News editors: To interview Drs. Harmon or Drezner, contact Kim Blakeley, 206.685.1323 or krb13@uw.edu.